About "ESV Value Edition Bible Truflat Walnut Celtic Imprint (Black Letter Edition)"
The ESV emphasises word-for-word accuracy and precision, along with literary beauty and readability. 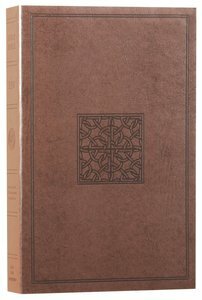 This attractively presented edition features 'truflat' binding, as well easy-to-read 8-pt type, two-column paragraph format, cross-references, section headings. 13.6 x 21 x 3.5cm.